The marinated cheese, served warm makes a great starter spread on hot toast or chunks of fresh bread bruschetta-style, or served with a salad it makes a lovely light lunch or supper. We promised to post the recipe so here it is. It’s a bit fiddly and takes a while to prepare and marinate. For the Supperclub we were making 10-12 every week for 4 weeks – you get the hang of it after a while. But it’s impressive when served – just don’t tell everyone how easy it is. Start this process a week before you want to eat the cheese. 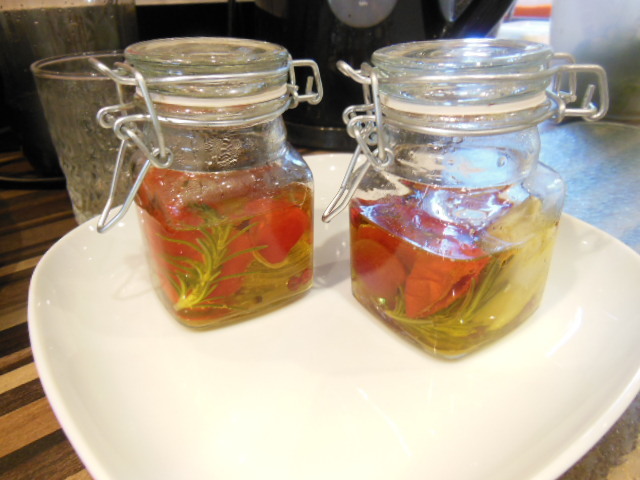 You can use any small jars with tight fitting lids, we use pretty little kilner-style spice jars. Wash the jars and lids thoroughly and sterilize in the oven or in a dishwasher to get them as clean as possible. Cut the goats cheese log into six equal pieces. Roll each piece gently in your hands into a small ball, then pop each ball of cheese into a jar. That’s the fiddly and sticky bit finished, the rest is simple. We roasted our own sunblush tomatoes and preserved our own artichoke hearts in olive oil – but you can get them from the deli counter or supermarket shelves. The real advantage of making your own is with a bit of time and effort, buying the vegetables in bulk from ‘pound-a-bowl’ on the market and preserving them, works out much cheaper and they last for about a fortnight in the fridge. Add to each jar one whole sunblush tomato, half an artichoke heart, a small sprig of rosemary, 3-4 slices of garlic, 5-6 peppercorns, and a tiny sprinkle of sea salt. Now gently pour over enough olive oil to cover the cheese. Seal the lid tightly and pop them in the fridge for a week. The oil will solidify and turn cloudy – don’t worry. Take the jars out of the fridge at least an hour before you want to serve them so they can return to room temperature otherwise they will crack and all your efforts will run away! Put all the jars into a high sided roasting dish and place on the hob. Gently pour hot water around the jars and put on a very low heat under the roasting dish. Don’t let the water even simmer, you just want to gently warm the oil and cheese for about 10 minutes. Serve immediately with fresh or toasted bread – your friends will love these little pots of hot garlicky cheese – guaranteed! You can play with the flavours or additions; change the vegetables or herb flavours, swap the goats cheese for feta, or even lose the cheese. As a vegan or pregnant-friendly version we replaced the soft cheese with extra artichoke plus a slice of roasted sweet pepper and a couple of olives. Equally delicious! 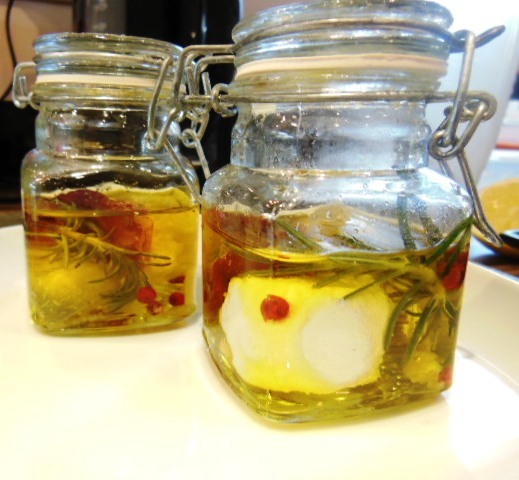 This entry was posted in Recipes, Supperclub and tagged Artichoke, cheese, cheese in a jar, Garlic, Goat cheese, Olive oil, Rosemary, sunblush tomato, Supperclub. Bookmark the permalink.